My Avalon Pride peach tree takes root and sprouts some shoots one year after planting. 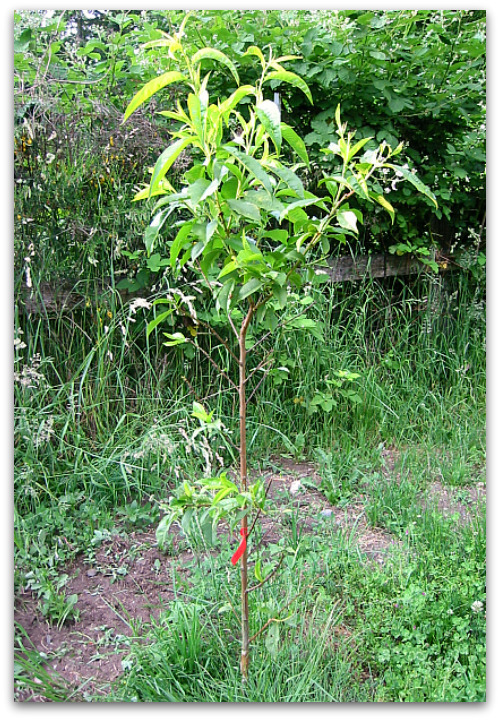 I wanted to add some peach trees to my orchard and thanks to One Green World nursery and UPS, three peach leaf curl resistant varieties showed up on my doorstep in no time at all. I chose Avalon Pride Peach, Oregon Curl Free Peach and Autumn Rose Peach. 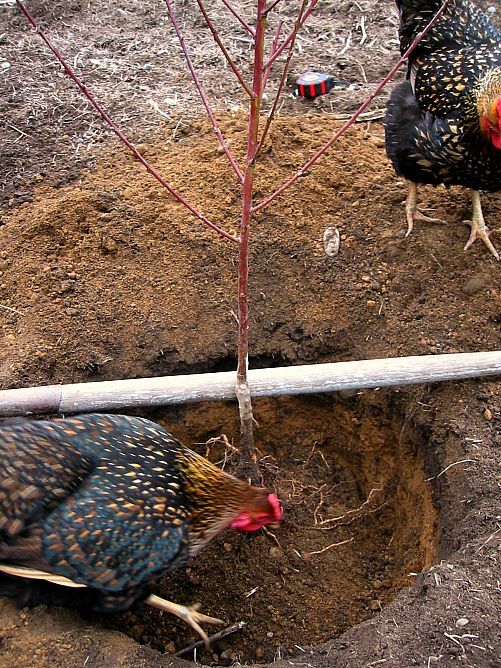 Since peaches move me like spinach, kale or broccoli never have, I decided to encroach upon my vegetable garden and plant the peach trees on the eastern edge.Here’s how I planted these bareroot babies. Arriving in March as bareroot trees, I unwrapped the box, removed the trees, and soaked the roots in a bucket of water up to top of the root graft for a couple hours to hydrate the trees. So when you order trees, know where they are going and plant them within 24 hours of arrival for best results. This is probably the most important step next to watering: digging the right size hole. It’s simple; always make it a little bigger than you need. From the research I read, it seems a shallower wider hole encourages more robust growth in the tree than placing it in a narrow deep hole. When you’re taking out the soil, really break it up and chew it up with your shovel. You want to create a lighter, less compacted soil. 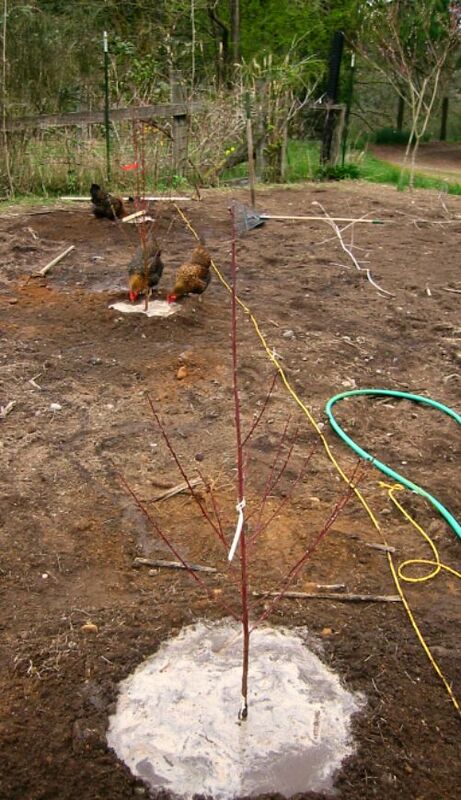 As you can see in the photo, my Golden Lace Wyandottes, Millie and Weesie (their names change weekly) are out to pluck as many juicy worms as they can, working top six inches of topsoil, the darker band in the photo.
. A bareroot tree is one that is planted when it’s dormant and without soil binding its roots. It’s sold that way. You only see bareroot trees available at nurseries in the late winter or early spring. There is a limited window as the trees are removed from the fields, roots kept moist in some sort of wet medium like sawdust or mulch and then sent to market. Shipping costs less and usually there are a greater choices and variety at this time of year. The roots are healthy and fibrous and well-represented. Say no to wimpy roots. Determine the finished soil level and make sure the roots have plenty of room and spread them out in each direction. 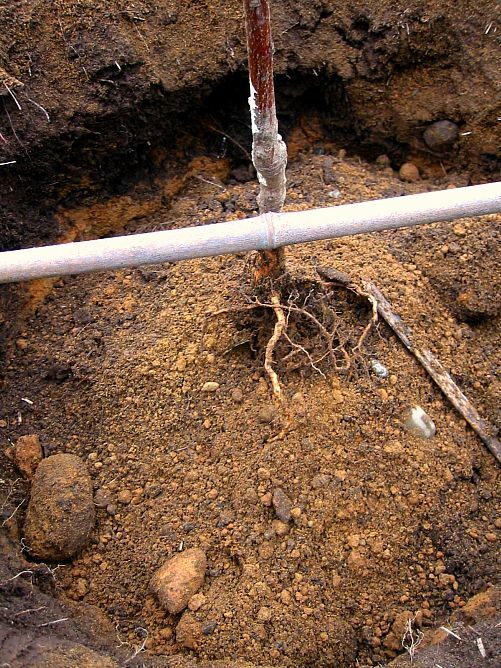 Place a stick across the hole and keep the tree trunk and root graft just above the soil so when the soil is returned, the tree is level with the soil. Gardeners will duke it out over this controversy. During my stint as a Master Gardener, the debate was heated, but university research shows that trees do not benefit from soil amendments, generally. In fact, loading up the soil with a bunch of compost, manure, sand, and kitchen sinks only discourages the roots from leaving their comfy well-fed hole. In my own experience, I’ve planted trees both with and without soil amendments and the well-dug, same-soil specimens took off after the third year. The pampered ones just hung out and grew lush, but seemed dwarfed. The roots are tender, exposed and fragile so be gentle and lightly drop the soil around the roots, filling in the hole and compressing lightly. Remove air spaces, but you don’t need to stomp down hard like its a hoedown. In the photo above, I still have to add more soil to reach my guide, the horizontal shovel handle. Add more soil if it settles after watering. Young trees need ample water, so I create a berm, a ridge around the tree trunk about two feet out to hold water. Fill the area with a slow flowing hose until it reaches the top of the berm. Drainage is important and if the water tends to sit there for a long time without draining, you may want to consider a new location. Prune out the dead branches and smile at your new long-term garden pal. You have chickens! I love chickens. You have such a beautiful farm and your life looks absolutely wonderful. I wish I could give up the daily grind and live on your farm. What do you do if you don’t have any chickens? Yep Annette it seems counterintuitive I know, but everything I’ve read says its best to loosen the soil (even clay soils) in a wide band as loading up amendments just acts like a sponge and holds water and rots the roots.